Behind the scenes of a new cover design by David Shields for a reissue of "American Wood Type"
Thirty-three years after its most recent printing, Rob Roy Kelly‘s seminal book on wood type, American Wood Type: 1828–1900 , will finally be offered in newly printed form. The 350-page tome is being republished in paperback form by Matt Kelsey at the Liber Apertus Press in Saratoga, California. Kelsey informs me that the book is being printed digitally, on-demand, from high-resolution scans of the original 1969 hardcover edition. It will be made available starting March 31 for a retail price of $29.95. The news will come as a relief to many students and others who have not been able to afford the prices which are usually asked for second-hand copies of the book. Both previously available editions — a 1969 hardcover by Van Nostrand Reinhold and a 1977 paperback by Da Capo Press — have been increasingly difficult to find at affordable prices. For example, at the time of writing this, only two copies are currently available on Amazon.com, both with price tags of at least $750. Thrifty buyers have been able to get the book for much cheaper (I lucked out on a first-edition hardcover on eBay for $95 last October), but such deals have become few and far between. 1964 precursor folio of "American Wood Type"
This newest reissue features a short foreword by David Shields, caretaker of the Rob Roy Kelly American Wood Type Collection, in which he gives a brief history of the book and explains the impact it continues to have on designers and printers (myself included). Shields has also designed a new cover with types from the collection, inspired by the cover of Kelly’s 1964 folio precursor to the book. In all other regards the book will be printed as a facsimile and, as such, will retain various typos and historical inaccuracies which David Shields and others have uncovered since the book’s first publication more than 40 years ago. While this is less than ideal, a proper follow-up would undoubtedly require much more work, time, and money; essentially it would be a different project. Shields’ foreword addresses these issues, referring readers to the Kelly Collection website for more current information (at least for the types in the collection). One of the many reasons a reissue of the book has taken so long is related to the complexities and uncertainties surrounding its copyright information. The original 1969 publisher (Van Nostrand Reinhold) and copyright holder (Reinhold Book Corporation) were split and merged with other corporations several times over the years, with the rights to the book being moved around, licensed on a temporary basis (for the 1977 Da Capo Press reissue), and generally changing hands on numerous occasions. Despite, and perhaps because of this, the original publishing agreements cannot be found. With the help of Rob Roy Kelly’s widow, Mary Helen, Kelsey researched and contacted all of the known corporate successors who acquired all or portions of the Van Nostrand Reinhold assets, and all have stated that they do not control the rights to the book. Kelsey’s conclusion — based on provisions that were common in agreements for scholarly works at that time — is that the rights have reverted to the author’s estate after the book went out of print. Under this belief, Mary Helen Kelly has granted a license to Liber Apertus Press for a reissue. For the first time the author’s family will receive royalties from sales of the book. For those who are curious as to why a reissue of American Wood Type isn’t being carried out by a more notable or relevant organization — like Oak Knoll Press, RIT Cary Graphic Arts Press, Harry Ransom Center, or the Hamilton Wood Type & Printing Museum — the main reason that I can see is that Kelsey is the first to go to the trouble of researching and contacting all the possible copyright owners. Also, as a smaller on-demand publisher, Kelsey avoids higher investment costs that other publishers might have to put up for traditional printing and binding processes. Adding another generation to the production process by scanning from a print will likely have some affect on the fidelity of the book’s reproduction, but I doubt it will be anything that would make the book worth anything less than $30. Indeed, the difference may be imperceptible. I’ve heard rumors that the original film negatives used to print the first edition still exist somewhere at Yale, which would be ideal for the purposes of reproduction (a proper digital scan of the negatives may even yield a better print than the 1969 edition), but I haven’t personally seen or heard anything concrete to that effect. Liber Apertus previously took on a similar reprinting of the letterpress printing guide, General Printing , and plans to continue the series by reissuing other such books like American Wood Type that are in demand but out of print. I must admit that my first gut reaction to the news that the book was being digitally reprinted, as a direct facsimile, using less-than-superior paper and binding, by a relatively tiny and unknown publisher, was something along the lines of skepticism. However, after remembering the shady lengths I went to in order to acquire my first copy of American Wood Type when I was a student (don’t ask), I ultimately think that having Kelly’s amazing book widely available again in any form is a good thing. Detail of pages 86–87 in "American Wood Type"
A remarkable new website for the Rob Roy Kelly American Wood Type Collection has just been launched, built on research and work by David Shields. 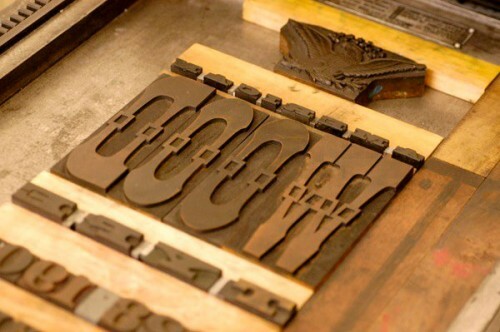 First, an abbreviated history of the collection: Rob Roy Kelly, throughout his many years of dedication to the study of wood type, amassed an invaluable collection of wood printing material. In 1966, when Kelly could no longer maintain his massive collection, it was sold to the head librarian of the Museum of Modern Art in New York. Later that year it was again sold to the University of Texas at Austin, where it now remains (for the full story, see the official history). 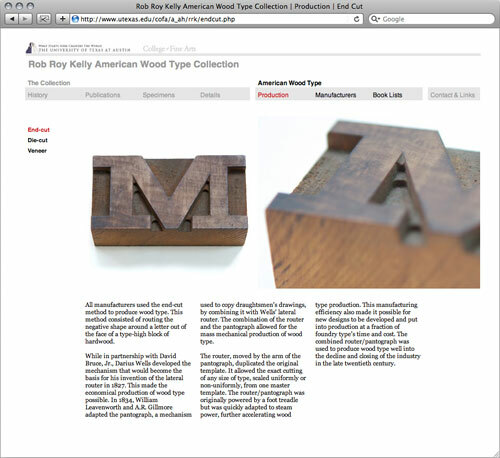 David Shields, who is currently the main caretaker of the RRK collection, has spent considerable amounts of time researching the history of the wood type industry in America, focusing specifically on information related to the collection. David summed up the newly launched site to me via e-mail as “a history of the collection, a list of Kelly’s publications, as well as a portfolio of specimen pages for all of the types in the collection with updated history of each of the types cross-referenced with all manufacturer names and final Hamilton production numbers” … In other words, this resource presents the kind of information that type historians wish existed for every type collection. The specimen pages with detailed, updated, and cross-referenced information about each typeface present a vast improvement in the quality of collected information about any of the often-elusive histories of these designs than has ever been available before in one place. This is no doubt one of the largest aspects of David’s research so far. Two industry-wide timelines are also invaluable resources: one summarizing the history of American wood type manufacturers, and another exhaustive listing of wood type specimen catalog publications. The manufacturers timeline is available in an interactive web-based format, and the catalog listing is presented in a standard text list (complete with bibliography), but the most informative presentation of both sets of information is as printable, high-resolution timelines, both included in a PDF document. 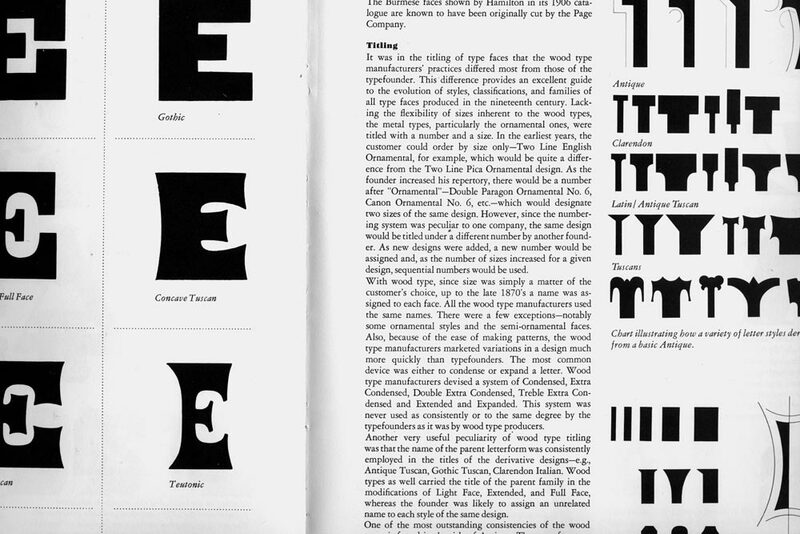 Given the obscurity of so much of the history of wood type, there is surely the possibility of information missing from both timelines (if you know of anything, I’m sure David would love to hear about it), but I can’t express how remarkable it is to see a collection of information like this with such a broad contextual scope. It’s the only presentation to date showing such succinct snapshots of the entire industry. 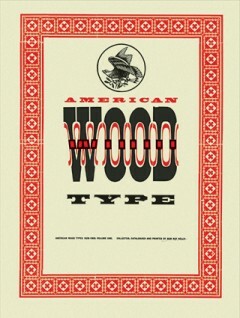 Another element of the site worth noting is the section discussing various methods of wood type production. The descriptions and comparisons of end-cut, die-cut, and veneer type don’t go into too much detail about the technical processes involved, but they do present a considerable amount of the history associated with each method. Finally: One of, if not, the most notable aspects of this resource, is the fact that it was published digitally, online, and made freely available for all to access. Research materials and information are so often limited by physical location and various administrative access restrictions. There are certainly good reasons for this — indeed, certain parts of the RRK collection will probably never be available online — but I think that by making a substantial chunk of his research so accessible, David can only inform a larger number of people, and perhaps, in turn, inspire them to address things he hasn’t yet been able to. When founding Woodtyper , I dedicated the journal to Rob Roy Kelly with the stated mission of “attempt[ing], in my own way, to at least begin to pick up where he left off”. However, if any one person in the world could be named as the upholder of Rob Roy Kelly’s legacy right now, it would undoubtedly be David Shields.